Zachary Hougland, a 17-year-old senior at Iowa’s Davis High School and a member of the cross country team was recently disqualified from a meet after helping a runner on the opposing team. A few minutes later, Hougland looked back at the course and saw Garret Hinson, a runner from the opposing team, collapse. No one was helping Hinson, so Hougland decided that he had to do something. 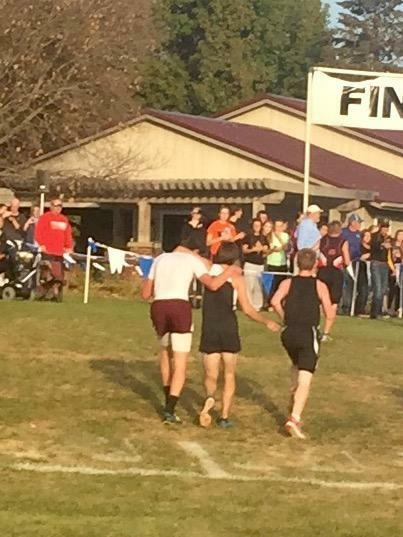 Hougland ran over to Hinson and helped him back up, guiding him to the finish line. “It was about 15 meters from the finish line. I did it for seven meters, so he had about eight left. I knew I couldn’t help him finish so I just gave him a push and told him you can do it,” Houghland said. This act led both Hougland and Hinson to be disqualified from the meet. Under the policy of the National Federation of State High School Association, competitors are prohibited from giving or receiving assistance. In a statement, Bud Legg with the Iowa High School Athletic Association explained the policy. “An athlete who receives or gives assistance to another runner in the same race is disqualified. While it was a sportsmanlike act to help someone in distress it remained a violation and the official had no choice but to enforce the rule,” he said. However, Hougland’s actions have been appreciated. Hinson’s mother called Hougland a hero. Houghland will still be able to run at the state meet because as a whole, his team qualified for state.